Easy to Love but Hard to Live With : Real People, Invisible Disabilities, True Stories. Edited by Trica Bliven-Chasinoff, MA, and Lisa Davis, MPH. Paperback, Kindle, Nook, e-book. 302 pages. ISBN 978-1-933084-04-6 (pbk). $18.95 (pbk), October 10, 2014. After Oct. 10, 2014, available through Amazon, BN.com, The Book Depository, and several other on-line retailers as well as Ingram, Follett, and Brodart for bookstores and libraries. 35 powerful essays from adults and those who love them with autism, mental illnesses, fetal alcohol spectrum disorders, OCD, ADHD, and other “invisible disabilites. Life with an invisible disability is often shrouded in isolation, shame, and judgment. The stories in this book lift the veil and let readers know they are not alone — that there is a community of strong, passionate, smart, funny, and exceptional people walking beside them. Instead of putting on appearances, readers are invited to celebrate and connect with who they really are. Join the conversation! The Easy to Love but Hard to Live With Facebook group. A beautiful exploration of the complexity of disability and how it affects our homes, our lives, our communities, and the global understanding of our differences. Feeling loved isn’t just something we want, it’s something we need – even more to manage the overwhelming stress that accompanies hidden disabilities. Raising a child with an invisible disability is one of the hardest and most heart wrenching experiences a parent can face. “Easy To Love But Hard To Live With” is filled with poignant stories that inspire and empower. 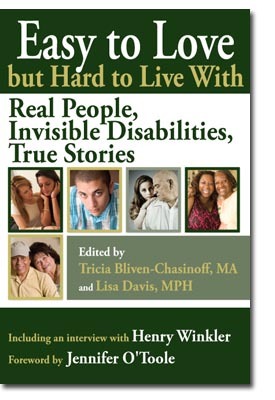 A great read for those living with a misunderstood partner, sibling, parent, child or other loved one.” It is also great for those living with invisible disabilities themselves. A compelling and relevant book revealing the complexities of living with invisible differences. It is important that people are open about their differences, invisible or not. “Easy To Love but Hard to Live With” immediately grabbed me. In fact, the very reason we created “Chicken Soup for the Soul, Children with Special Needs” was so parents could share their stories with others to let them know they are not alone. One time when my son with autism was five, a woman at Costco approached me, all the while shaking her finger and yelling at the top of her lungs “you should be ashamed of yourself, you can’t manage your child”! Everyone stopped and stared at me and I felt like crawling in a hole and dying. After reluctantly sharing my story with others, I learned others had similar experiences and I began to feel less alone in the world. In “Easy to Love but Hard to Live With” you hear stories from adults and those who love them. Many of them grew up hearing what I heard from the people like the woman at Costco. Their stories are poignant, funny, heartbreaking at times, and most of all, need to be heard. >Finding that common powerful bond between us, in a world of judgement and cruelty from those who don’t understand, magically transforms our journey and makes it easier to cope. Instead of putting on appearances for others, we can choose to connect with who we really are and accept our lives. As a result, we will grow tremendously, choosing love instead of fear, peace instead of turmoil and make our world a much better place overall. It starts in our own hearts. You’ve got to read this! “In today’s fiercely-paced society, stories of human courage a midst despair and heart-breaking challenges are needed more than ever. I have savored each page of Easy to Love, But Hard to Live With, and it has reminded me to not only MAKE the time to intentionally slow down and see things from different angles, it has reminded me of why my own personal mission is so crucially important! The wisdom and real-life success stories told throughout this book will prove to be inspiring, enlightening and engaging. The stories written were so raw and open. It’s amazing how the struggles people have can either make or break them! These people chose to survive and thrive!!! I am so very blessed to have read this book and so enjoyed reading it. I was teary throughout the book and felt so many emotions as I progressed through it. I feel very connected to these wonderful people. I It truly causes the reader to realize that everyone has an important story to tell and if we only listen, we will be forever touched. Tell Us More sections of the book provide scientific and professionally written explanations for further understanding of each invisible disability. Simply brilliant! Easy to Love but Hard to Live with” is an inspiration and yet, at times, a heart-breaking journey into the lives of those who have lived with every type of disability and yet conquered mightily despite. These stories elicit not just compassion, but true inspiration showing that anyone can walk the same path and reach the end as a true every day hero. I personally resonated with Henry Winkler’s childhood story, along with many others, that highlight the ongoing lifetime of learning..always knowing, that in the end.. it will all be just fine. Being a motivational speaker and writer I’m always searching for stories that will move. Reading these passages has done just that. It gives us a great look at overcoming adversity and rolling with the punches. –Cornell Thomas, Motivational Speaker. Author of The Power of Positivity: Controlling Where the Ball Bounces.